If you have little ones who are big fans of PBS Kids, then no doubt they have come to love Miss Lori and her sidekick Hooper. 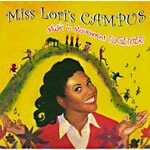 Lori Holton Nash was recently bestowed the honor of becoming the first host of PBS Kids and now she has another wonderful addition to add to her list of accomplishments: Miss Lori’s Campus: Music ‘n Movement Together. Miss Lori’s Campus: Music ‘n Movement Together is an addictive (really, it is) compilation of children’s songs that will get your toddler up and moving to the beat of the music and dancing to the beautiful music that Miss Lori makes. Miss Lori’s Campus encourages kids to be active, sing along, and dance through sixteen songs that teach colors and snippets of foreign languages and also helps young kids use and expand their imaginations. And for the final song, Miss Lori winds down the up-beat CD with “Goodbye Lullaby”, which nearly put us to sleep and will definitely get your little one primed for a nap. Where to buy: Wal-Mart. Retails for $9.88. Next postYou Have Got to Be Kidding Me! Why Show the Omaha Shooter?